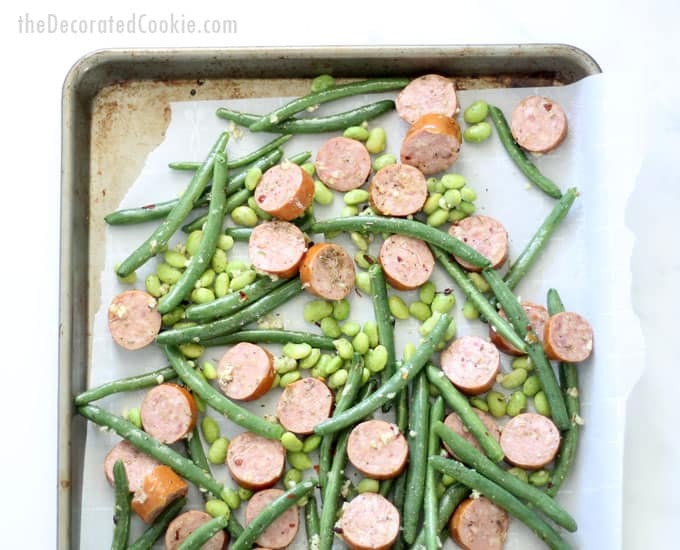 Kielbasa sheet pan dinner with green beans and edamame. EASY! 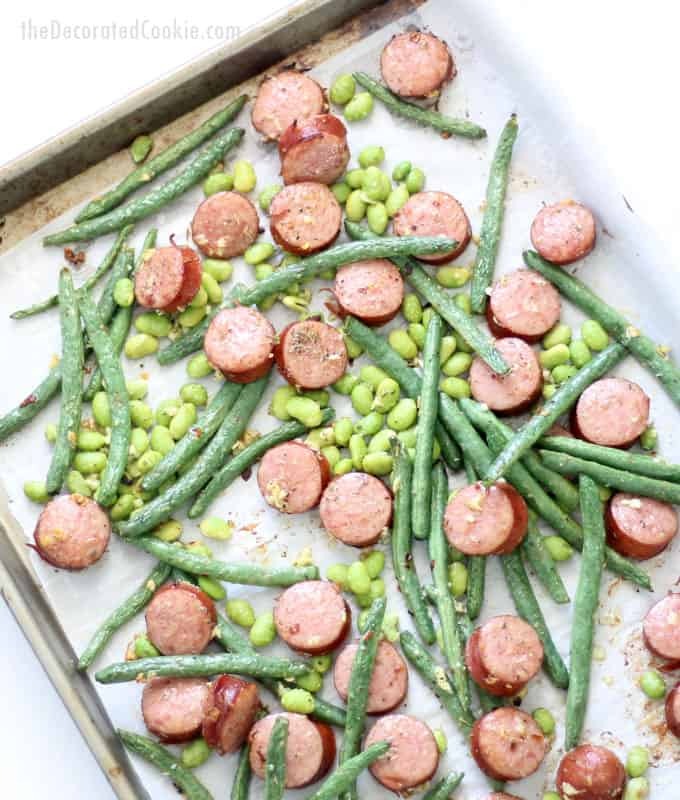 This easy kielbasa sheet pan dinner with green beans and edamame is a delicious, low-carb, weeknight dinner idea that takes less than thirty minutes to make. 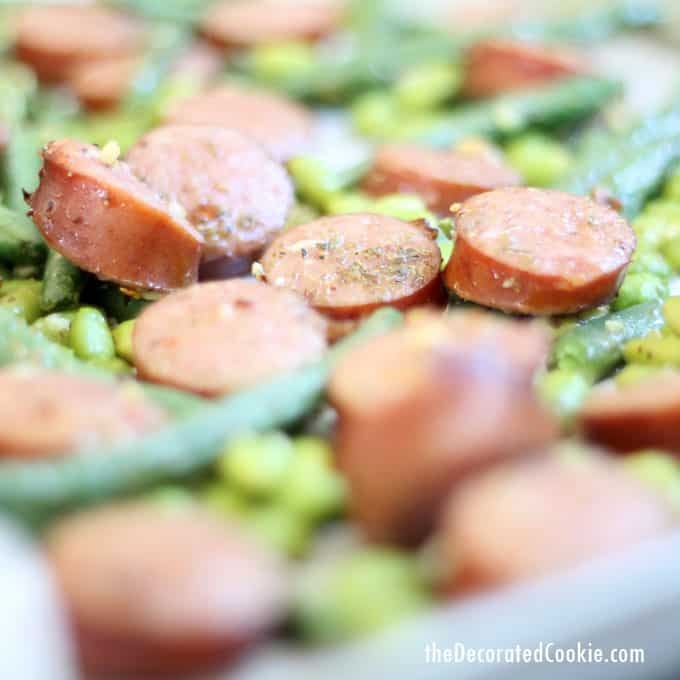 I’m taking a break from all the sweets to bring you one of my all-time favorite, easy dinners to make: Easy kielbasa sheet pan dinner with broccoki and edamame. 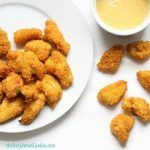 This takes about thirty minutes from start to finish, it’s low-carb (I’m not no-carb, but I am cutting back), t’s gluten-free, it’s minimal clean-up, and it’s crazy delicious. Oh, and possibly also keto and Whole 30? Yes? 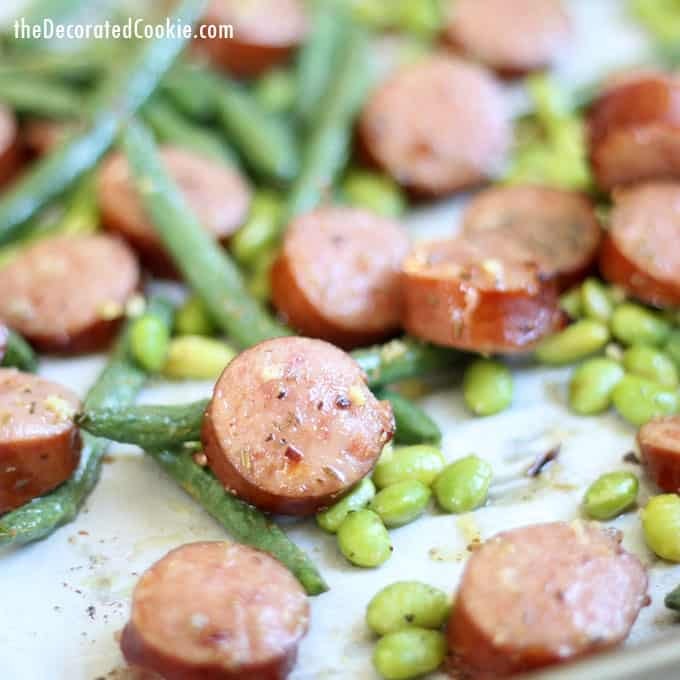 Here, I combine kielbasa, green beans, and edamame with some oil, garlic, and herbs, pile it on a baking sheet, stick it in the oven, and yum. Awesome dinner. I end up eating half the tray before I can even serve it up. 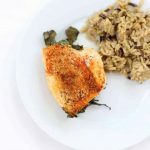 Need another sheet pan dinner idea? 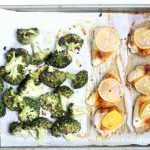 Try this awesome lemon chicken and broccoli sheet pan dinner. I use frozen, shelled edamame because it’s easy peasy. Edamame does have some carbs in there, so if you’re really anti-carb, just cut this ingredient and add more green beans (which have half the carbs). 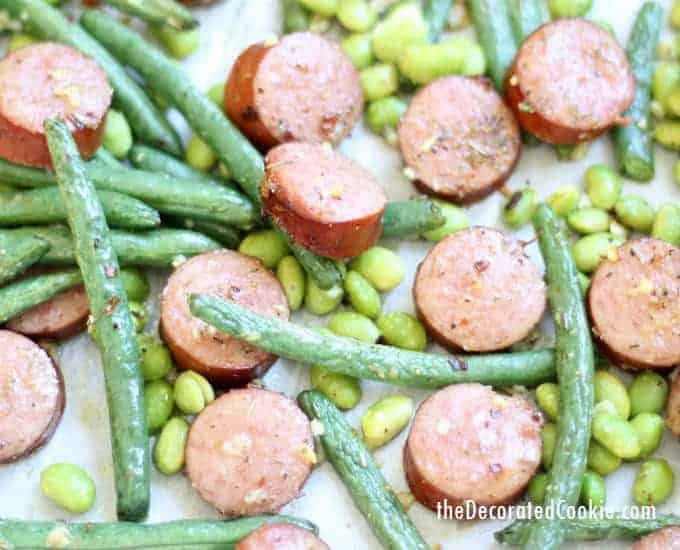 I like pairing green beans and edamame with the kielbasa because kielbasa doesn’t take too long to heat up and green beans don’t take too long to cook. Asparagus is a good substitute. Play around with your favorite seasonings. Instead of oregano, try adding dried basil. When they are in season, I use fresh herbs. You can also add a squeeze of lemon. I like keeping the green beans whole, but you may trim them if you prefer. I use less salt in this recipe than in other sheet pan recipes because the kielbasa has so much salt already. Feeding a crowd? I love my professional-size baking tray. It fits in my oven, but holds a lot more. Like the oven mitts? I found them at amazon. 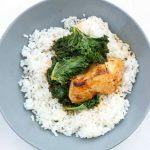 FIND THE LEMON CHICKEN AND BROCCOLI RECIPE HERE. Preheat oven to 425 degrees F. Line a rimmed baking tray (sheet pan) with parchment paper and set aside. 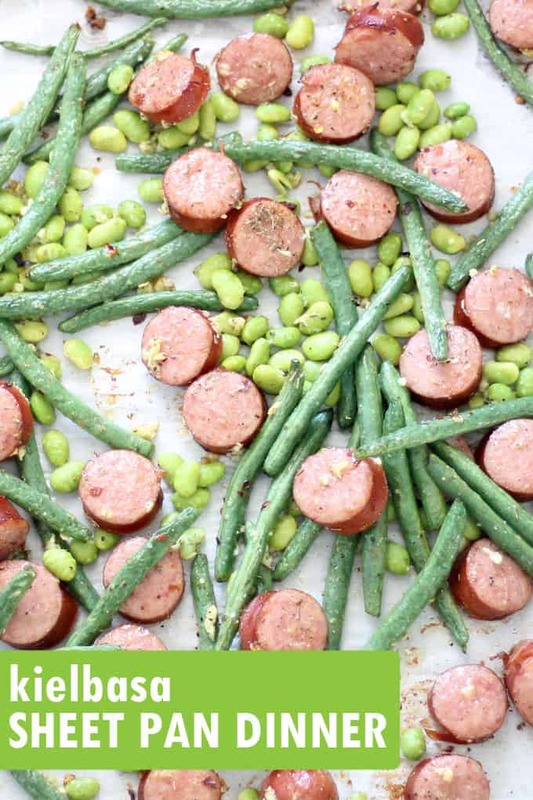 In a large bowl combine the kielbasa, green beans, edamame, garlic, olive oil, oregano, peppers, and salt. Mix well and spread on the prepared baking tray. If desired, sprinkle a pinch more lemon pepper, red pepper flakes and/or salt over the mixture. Bake for 16 to 18 minutes or just until the green beans are tender crisp.